"The best after-dinner drink! Just use Irish Cream instead of cream and sugar - how easy is that?!" Pour hot brewed coffee into a mug. Stir in Irish Cream. 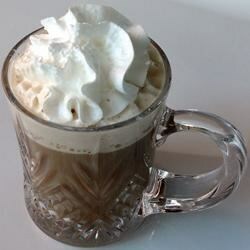 Irish whiskey, hot coffee, and whipped cream knock out winter’s chill. this is a good coffee drink. It is not Irish Coffee. My husband & I can't wait for the Holidays because it's the only time I will let him buy Bailey's. Now it's just not the Holidays until the Bailey's has been cracked open! All my life I hated coffee,til my friend made me one of these. Now I LOVE coffee. This is my preferred way of drinking coffee, SO yummy and it gives you that warm all over feeling... like you could snuggle into some blankets on the couch. A definite for winter, I LOVE these!